Preheat the oven to 350°F. Line a standard cupcake pan with paper baking cups, or grease with butter. Sift together the flour, baking soda, and salt and set aside. Place the butter in the bowl of a stand mixer or in a bowl with a handheld electric mixer. Beat on medium speed until fluffy. Stop to add the sugar; then beat on medium speed until well incorporated. Add the eggs one at a time, mixing slowly after each addition. Combine the vanilla extract and milk in a large liquid measuring cup. Reduce the speed to low. Add one third of the flour mixture to the butter mixture, then gradually add one third of the milk mixture, beating until well incorporated. Add another third of the flour mixture, followed by one third of the milk mixture. Stop to scrape down the bowl as needed. Add the remaining flour mixture, followed by the remaining milk mixture, and mix slowly until just combined. Add the sifted cocoa powder, beating on low speed until just incorporated. Add the Irish Cream, still beating on low speed, until just incorporated. Use a standard-size ice cream scoop to fill each baking cup with batter, so that the wells are two-thirds full. Bake for 18 to 20 minutes (start checking at 15 minutes) or until a toothpick inserted into the center of a cupcake comes out clean. Transfer the pan to a wire rack to cool completely. Mix all ingredients in an electric mixer for approximately 5 minutes, until the frosting is light and airy. 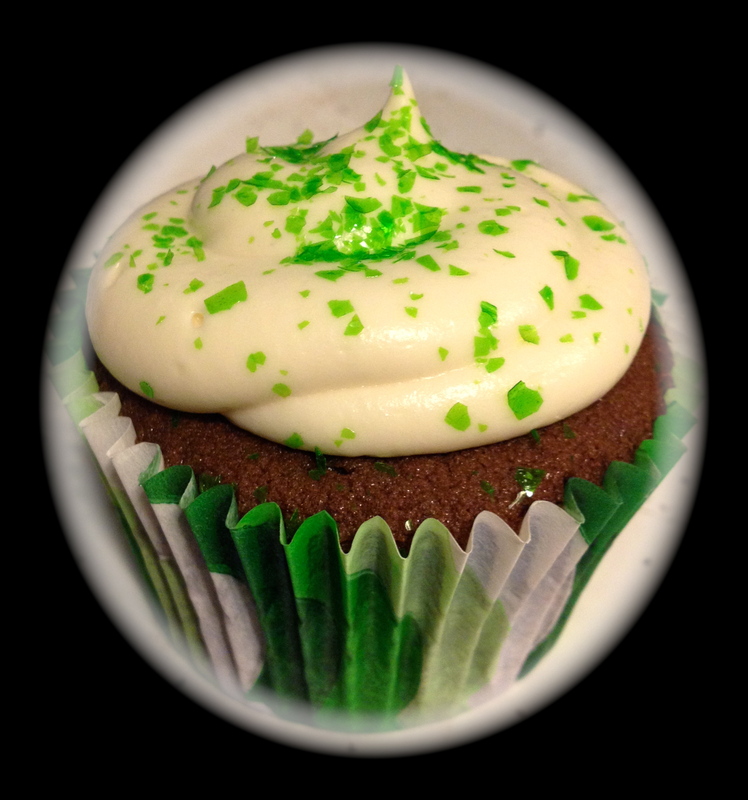 The Irish Cream will give the frosting a slightly beige color. Transfer the frosting into a plastic disposable piping bag, fitted with a large round metal tip. Be sure to whip up your frosting so it is light and airy. Start in the center of the cupcake, applying pressure to the bottom of the bag, and guide the tip around the cupcake in a circular motion, then end in the center with a burst of pressure. Try to move quickly and confidently. If you go too slowly, the frosting may come out uneven. You can then add your decorations. Click Here to Download a Printable Version of this Recipe!